Posted May 24, 2016 & filed under Event, free Houston event, News, WITS People. Spend an evening with WITS on Thursday, June 2nd, 6-10pm for Mid Main’s First Thursday event. There will be live music, performances, art shows, tasty drinks and appetizer specials. A $5 donation will give guests access to the Art Garden and drinks from Topo Chico, St. Arnold, and Deep Eddy. Proceeds will benefit WITS and help us bring the WITS creative writing program to more Houston children! Posted April 15, 2016 & filed under Contest, News. It’s National Poetry Month, and students in grades 5-12 are invited to enter the Dear Poet Competition this April. Students respond in the form to one of a select group of poetry videos, including the one above by Juan Felipe Herrera, the US Poet Laureate.To enter, email your letter to dearpoet@poets.org by April 30, 2016. Winners will be published on the poets.org website in May. Posted April 13, 2016 & filed under Contest, News, Notebook, Poem, Student Writing. Middle and high school students from the surrounding Houston area are invited to participate in the 2016 Watershed Awareness Student Contest! The theme is Our Bayous, Our Pollution. Houston- area bayous and waterways lead to Galveston Bay in turn affecting the Gulf of Mexico and its Flower Garden Banks. Help raise awareness about our local watershed and bring attention to the importance of the health of our local waterways, bayous and our bay! We challenge you to research, explore, interpret and say something meaningful about the connections between human activity and the health of our bayous and ocean through art or shape poetry. Posted April 10, 2016 & filed under News. What if food could talk? During April WITS showcases food-themed poems written by Houston students, reaching 600,000 customers at four H-E-B markets: Montrose, Buffalo Speedway, Bunker Hill, and San Felipe. So, as customers pick through apples, they read poems about apples. These students words make shopping a unique experience at H-E-B! The grocery poem project is made possible by H-E-B Tournament of Champions, Copy.com, and the City of Houston through the Houston Arts Alliance. Posted March 3, 2016 & filed under News. Writers in the Schools is looking for enthusiastic college students to join our team of interns this summer. These exciting and rewarding positions will work alongside writers and teachers to get youth excited about writing. Internships begin June 1st, 2016. Both full-time and part-time positions are available. Applicants must be enrolled in a college or university and be 18 years of age or older. Posted May 6, 2015 & filed under Event, News. 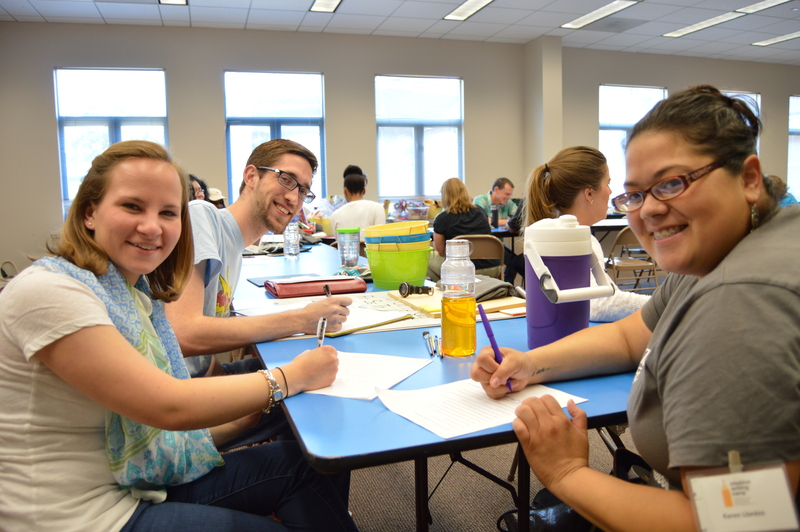 WITS will sponsor two courses being offered at the 2015 Common Ground Teachers institute that will be held from 10 a.m. – 2 p.m. June 26 – July 10. For more information about this innovative institute, click here. Teachers who submit a reservation by May 31st (extended to June 10th) will be offered a place in one of this summer’s Common Ground seminars. After June 10th, participants will be added on a first-come, first-served basis until each seminar is filled. Please contact Keri Myrick with any questions. Apply for the 2015 seminars here. Writers’ Conference April 10th & 11th in Houston! Posted April 10, 2015 & filed under Event, News, WITS People. WITS Writers Elizabeth Keel, Dulcie David, and Maryann Gremillion with Sandra Campbell from Houston Grand Opera will present dynamic, interactive workshops on Saturday. Friday, April 10, 7:00 pm, at Belin Chapel on the campus of Houston Baptist University. In this address, Scott Cairns — Guggenheim fellow, Dennis Levertov Award recipient, librettist, anthologist, and multi-award-winning author of numerous books of poetry and nonfiction — will read a selection of his work and talk about the writer’s/artist’s vocation. Standard Registration is $35, which includes lunch Saturday. Continuing Professional Education (CPE) Registration is $75, which includes lunch Saturday and 5.25 Continuing Professional Education hours. HBU Students, Faculty, and Staff Registration is free – lunch is not included with the HBU-affiliate registration. Complimentary notebooks, pens, coffee, tea, and water will be provided for everyone. Individuals are responsible to reserve their own accommodations. Please see the Hotel Information link for more information. Calling Poets in Grades 7-12! Posted March 31, 2015 & filed under Contest, News, Poem, Student Writing. As participants in NaPoWriMo, Flashbang!’s Sarah and Jeff are writing and posting a poem a day for the month of April. But we want more! We want your poems. Send us your love poems, hate poems, pet poems, unicorn poems, football poems, name poems, video poems, macro poems, gif poems, breakfast-lunch-and dinner poems. Come back to the blog every day in April for a new writing prompt and at least one new poem. Note: The poems you submit do not have to be based on the prompts we publish. If they are, that’s awesome! Let us know! But more important than following our prompts is writing something you love. Send us what you love. To submit: Send an email with your poem attached as a Word document or just pasted into the body of the email to flashbangwritingATgmailDOTcom. Please include your name, age, and school name in your submission. (School names will not be published unless you explicitly ask us to do so.) Let us know where you heard about us, too. Deadline for consideration for KaPow! and the NaPoWriMo celebrations is 4/25. BUT we will still consider poems on a rolling basis after that deadline for publication on the blog. Posted March 24, 2015 & filed under Event, News, WITS People. Join WITS Executive Director Robin Reagler and WITS Board Member Shannon Buggs at the 2015 Leadership in the Arts Summit! Look below for information about how to register for this informative and inspiring event. The upcoming Summit focuses on the best practices and ramifications of audience engagement initiatives that move the arts from a transactional exchange to a long-term stewardship model. With the shifts in demographics, technology, funding streams and an increase in “competition,” many organizations nation-wide are attempting a broader array of tools to engage audiences. Efforts range from increased artist engagement, marketing efforts, technology-initiatives, and advisory groups and special event programming. These initiatives call for new competencies, new levels of partnership and working outside of comfort zones. The day will be moderated by Dr. Paul Bonin-Rodriguez who gave the opening keynote at last year’s summit. The presentations will be livestreamed for an online audience. Logistics: Directions & Parking – via GoogleMaps. The 2015 Leadership in the Arts Summit is sponsored by the College of Liberal Arts and Social Sciences and the UH Arts initiative with support from the UH Center for Public History Lecture Series and the Houston Endowment. Posted March 17, 2015 & filed under Fiction, News, WITS People. News to celebrate! Chris Cander’s novel Whisper Hollow is released today! It’s a multi-generational story that focuses on the lives of three women living in a coal-mining town in West Virginia. Order your copy today and check out the touring schedule here. Congrats, Chris! Looking for a Fabulous Summer Internship? Posted March 10, 2015 & filed under News. Writers in the Schools (WITS) is looking for interns for Summer 2015. Interns will work in Houston, Texas, in a variety of areas, gaining experience in creative writing instruction, early childhood education, non-profit administration, marketing, and/or arts education. Internships also serve as networking opportunities to meet colleagues in education, arts education, and creative writing fields. Upon successful completion of the internship, WITS will serve as a reference and will provide letters of recommendation. Please visit our website to read about and apply for one of our three internships: Education Marketing, Meta-Four Assistant Coach, and Teaching Assistant. Posted March 2, 2015 & filed under Event, News. WITS Meta-Four students performed civil rights inspired poems at the Wortham Theater on Feb. 8th with Congressman John Lewis. The sold out event celebrated MARCH, the graphic novel based on Congressman Lewis’ memoir chronicling his participation in the civil rights movement. The students received a standing ovation, and at the end of the evening Mayor Annise Parker declared John Lewis Day.This event was sponsored by the Houston Public Library. For more information, click here. Who Will Be the Next Houston Poet Laureate? Posted February 26, 2015 & filed under Contest, News. Are you a poet who loves Houston and wants to encourage Houstonians to read and write more poetry? Apply to be the 2nd Houston Poet Laureate! The Houston Poet Laureate Selection Committee announces the application/nomination process for selection of Houston’s second Poet Laureate. Submissions are welcome from persons nominating a poet for the position of Poet Laureate or from individual poets who are seeking the position. Only emailed applications will be accepted. For more information, please visit the Houston Public Library website for guidelines, expectations, terms, and more! Writers in the Schools (WITS) has been awarded a three-year grant from Youth Speaks to help develop and expand Houston performance poetry programming. The grant will help expand access to the Meta-Four Houston slam team that represents Houston both locally and nationally.The grant is part of the Brave New Voices (BNV) Network Initiative which was launched by Youth Speaks of San Francisco after receiving initial funding from two Bay Area supporters, as well as the Ford and Surdna Foundations. Posted February 10, 2015 & filed under Event, Fiction, News, Poem, WITS People. Don’t miss former WITS writers Lacy, Nancy, Jameelah, and David at the upcoming Blaffer Art Museum Innovation Series event on Feb. 17, 4 p.m. The Blaffer Art Museum Innovation Series is the most ambitious lineup of public programs the museum has ever organized around a single exhibition. Janet Biggs: Echo of the Unknown features works inspired by the artist’s memories of the effects of Alzheimer’s on family members. Combining video, sound and objects, this multidimensional exhibition draws on heroic stories of public figures coping with the disease and research conducted with neurologists and geoscientists to raise fundamental questions about how we become—and lose our sense of—who we are. Designed to amplify the exhibition’s role as a catalyst for cross-disciplinary learning, the series’ lectures, presentations, gallery talks and interactive programs will highlight collaborations across the UH community and beyond. Please attend “Memory & Identity: Five Writers Talk about the Difficult & Dynamic Relationship Between the Two” with Peter Turchi, author of A Muse & A Maze; Lacy M. Johnson, author of The Other Side; Nancy Pearson, author of Two Minutes of Light; Jameelah Lang, Ph.D candidate, UH Creative Writing Program; & David Stuart MacLean, author of The Answer to the Riddle is Me: A Memoir of Amnesia. Posted January 5, 2015 & filed under News, Notebook. The Museum District Business Association recently honored Writers in the Schools with its 2014 Community Improvement at the Hotel Zaza. The award was presented to WITS Executive Director Robin Reagler by KPRC-TV’s Chief Meteorologist Frank Billingsley.For a list of the 2014 recipients, click here. Posted December 10, 2014 & filed under News, WITS People. In the latest issue of KIRKUS REVIEWS, WITS writer Lacy M. Johnson’s THE OTHER SIDE: A MEMOIR is listed as one of the top memoirs of 2014. Founded in 1933, Kirkus has been serving book lovers for over 80 years. Kirkus Reviews magazine gives the scoop on notable books about to be released and provides thoughtful reviews of the best fiction, nonfiction, children’s,and teen books. Congratulations to Lacy! Posted September 4, 2014 & filed under Event, News. WITS will be presenting several exciting panels at the 2014 Houston Arts Partners Conference. This year’s theme is The Global Classroom: Cultures & Communities. Come out to hear Nick Rabkin, the Keynote Speaker, who has more than two decades of experience as an advocate for the arts in public education as well as Featured Speaker James Haywood Rolling Jr., Dual Professor of Art Education and Teaching and Leadership in the College of Visual and Performing Arts and the School of Education at Syracuse University. Advance registration is closed, but you can register in person on the day of the conference for $5 more. For more information about the panels and the schedule of events on September 5th & 6th at the Hobby Center for the Performing Arts, click here. Posted August 1, 2014 & filed under News. Posted June 11, 2014 & filed under Event, News, Notebook.